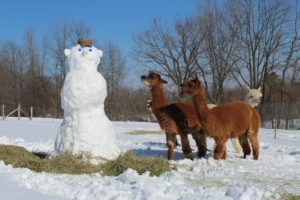 What’s on an alpaca farmer’s mind? Well, that becomes abundantly clear in the wee hours of the night as you lay in bed and your mind plays a reel of images and thoughts round and round. 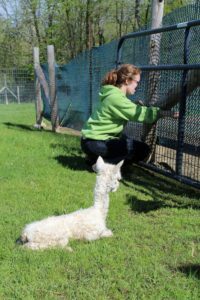 If you are thinking of becoming an alpaca farmer and wonder what that reel will include – read on! We often hear that the worries of farmers are many, and that is certainly true. While it is a wonderful life tied ever so closely to nature, you must stay on top of nature and be ready for anything it throws your way. As the years go by, you perfect that dance and learn to anticipate the up beats and down beats. It becomes second nature. 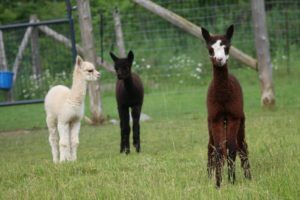 What is not expected are the days and nights of excitement and anticipation that come with alpaca farming. Our work load is certainly lighter than most types of farming you might be familiar with, but the joys and fun that come along with it often seem greater. Many a night I lay in bed just filled with anticipation about everything from a new arrival, to new clients about to start their own herd. Joy and excitement certainly outweigh worries and concern on our farm. How cold will this winter be? me in those times are how this community of alpaca farms come together and support one another. You don’t even have to ask, and help is there on your door step. With support like that, sleep comes a little easier during those tough times we all experience sooner or later. So what keeps us up at night at Oak Hills Alpacas? Well, we are a family of three, and I polled us all to see what is on our minds in the wee hours of the night. If you are not yet farming, it may seem impossible to imagine that you will lay awake at night wondering if grass will grow! But it’s true. Given the extremes of weather we now experience, a big concern for all farmers is how the hay crop will produce in any given year. We monitor our pastures closely, taking great care to ensure it is preserved and continues to grow. For pasture in particular, I lay awake thinking about when is the right time to rotate the herd to a new pasture and rest another; and when and how to fertilize each pasture to ensure its nutrients are replenished for another year to come. Will grass grow to feed the herd? Though we can never control it, when extremes of weather present themselves, we lay awake worrying about rather the herd will be too hot, too cold, or rather enough rain will fall to replenish the sistern from which we water the herd. And if there is too little rain fall will the pastures remain green enough to nourish the herd? During our 8 years of raising alpacas we have learned that Mother Nature and Father Time are truly in charge. They will bring what they bring, and we had better be ready. So we replenish the sistern with every rain. After last year’s drought in Ontario we take no rain for granted. We have cria and adult coats at the ready for any bitter winter day or night. Our barn is equipped with fans to battle the heat and bugs. And we employ rotational grazing to ensure that the herd has green grass throughout the season. Ice storms have been a particular concern the past few winters, so we watch for warnings and ensure that hay and water are in good supply in the event that we can’t make it to the barn for several hours when the ice is at its peak. When cria season arrives, we begin to lay awake at night with both wonder and worry. Will our cria all arrive safe and healthy? Will all the dams be well after their deliveries? Will all the cria catch on to nursing or will we have any bottle feeding to do? Will we make it through those early days and keep the predators at bay while the cria safely get on their feet? I can honestly say that while we continue to worry about these things year over year, alpacas promise relatively simple, trouble free deliveries with healthy outcomes and no need to bottle feed, and this has certainly been the case on our farm. And should we shear our cria or not – a question that we debate each year. Will the cria catch on to nursing? There is always the slight concern about injuries, particularly when those new little ones hit the ground with their tiny little legs. As they race up and down the fields, wrestle with one another, and walk between the legs of all the adults, we constantly worry that one of them might get hurt. While it is amazing how sturdy they are, as with any kids, you are never free from worry until they are fully grown. You are always on watch for any hazards around the farm that might bring harm to any herd, from loose fencing wire to dips and holes in the pasture. 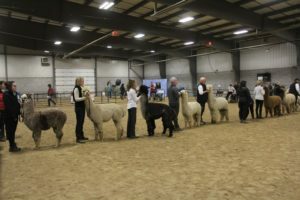 Once a year we get a chance to strut our stuff on the alpaca show circuit. At Oak Hills we love to show, but there is a lot of preparation and work that go into show. As the show approaches we all lay awake in bed thinking about what it will take to get everything ready. How do I ensure everyone gets to the ring on time? the supplies and feed. We check our tack box to ensure we have everything we might need. I lay awake worrying about maintaining the health of our show stock from start to finish and how I am going to get everyone in and out of the ring on time as the number of alpacas we show grows year after year. Of course, the primary concern whenever we have alpacas on the road is safety. For us, preparation is the key to allaying all these worries. Again we use checklists we have developed over the years to ensure we have everything we need. And we employ quarantine protocols to ensure the health of the herd as a whole when our show stock return to the farm. Shearing day is the biggest, toughest day of the year on any alpaca farm. Every alpaca is shorn that day, health checked, and placed in a stressful environment that is a stark contrast to the other 364 days of they spend quietly grazing in the fields. The mind is filled with thoughts of the preparation and organization that must be in place before the day arrives to be sure all goes well. On our farm we welcome over 20 volunteers that day who help with everything from record keeping to handling the alpacas. In the weeks before shearing day your thoughts fill with questions like, will everybody show up? Will we have enough food? Did we forget any supplies or equipment we might need that day? Will anyone or any alpaca get hurt or cut – which is possible when working with livestock and very sharp shears. Over the years we have laid these concerns to rest by developing detailed checklists and record templates for the day, and recruiting both experienced and new volunteers to ensure we have experienced help on hand. What will I do with all this fibre? This is a question that I no longer lay awake at night thinking about. The value chain for fibre has grown over the last 5 years in Ontario to the point that we have a number of accomplished farms who act as aggregators; buying our fibre, processing it and dealing directly with the retail market. So as much as I love fibre, and enjoyed the days of having it processed and then selling it to consumers, our fibre is now sold the day it is shorn and leaves the farm at the same time. And we now focus on what we love to do – helping others find their ideal herd and start their own alpaca farms. Where will I find customer interested in my animals? 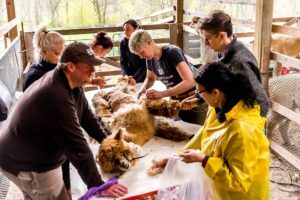 Again, this is something that worries some, but we have always been successful in finding prospective alpaca farmers using a variety of techniques. We do key on site exhibits with the alpacas where we know we will meet the right people. We remain active on social media. 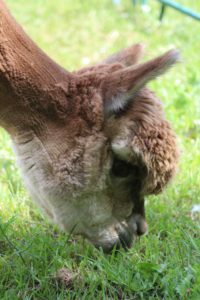 We maintain a helpful, attractive website (www.ohalpacas.com) and I write these articles for Camelid Quarterly to share our experience with others who may be considering an alpaca lifestyle, telling them what our journey has been like and encouraging them to make the leap. The result has been a wealth of new clients and friends made that have become like family to us. That alone leaves me up at night in wonder at how full our life has become with treasured friends and clients. The other place our minds wander to as we slip off to sleep is all the improvements or maintenance projects we would like to do in the weeks and months ahead. What needs to be done? What investments we need to make? 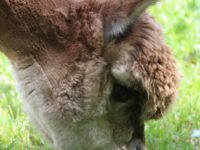 What can we do to add to the alpaca’s comfort and health? What repairs & maintenance need to be done? Ours is a new farm, established in 2009, but it does not take long before fences need attention or other projects, both big and small, become necessary to keep the farm in tip top shape. While we are blessed with amazing neighbours, and good distances between our properties, neighbours can be an issue from time to time. If you don’t have problems with your neighbours, you may spend some time thinking about how to ensure you maintain those good relationships while farming alongside them. The land beside our farm has just gone up for sale and our greatest concern is who will purchase it? What will they do with it, though there are zoning and set back restrictions on the land. Will they be farm friendly? 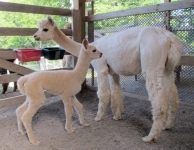 And will they have dogs, which can sometimes pose predator concerns for alpacas. As the record keeper in the family, many of my nights are spent lying awake thinking about bookwork and record keeping. I work off farm, so it can be a challenge to find the time to do the accounting and herd records, keeping them current and up-to-date. As the deadline approaches for HST filing, or the barn book is filling with data that has not been entered into our herd management software, you will find me laying awake wondering how to add hours to the day to get it all done. And there is no question that as you lay in bed on a summer’s night with the windows open listening to the coyotes sing in the distance, a chill runs down your spine. Predators are never far from your mind. As we walk the fields we are always checking the fences for gaps a predator might breach. And our dog is always on duty, but still, it’s a worry you rarely shake. Healthy worry is where vigilance begins – and that is how we manage predators on the farm, with vigilance. We always work to balance of nature and determine how we tip that balance in our favour. One wise old farmer told us that coyotes are lazy, so if you make it difficult for them you win the battle. We have always employed this philosophy to keep our herd safe. Still, when they sing close by at night, sleep is difficult to find. There’s a whole other set of preoccupations that keep you up at night when you are starting your farm, and they all boil down to, “I’ve never done this before. Can I really pull this off?” Let me reassure you that if a family like us can move from the city to a small (7 acres at the time) parcel of land and turn it into a home and then a farm, so can you. You will be surrounded by a community of alpaca farmers that are ready and willing to mentor and help you along the way. Ask questions, visit farms, and work with a good, reputable breeder when you do get started that has the capacity to support you along the way. Yes, there are worries that come with all enterprises, even alpaca farming. But alongside those worrisome nights are dozens more filled with wonder and excitement that only alpaca farming can bring. While shearing day is stressful, it can also be one of the most fun days of the year. We turn a big job, into a big party with friends and family. In the days leading up to the big event, we can’t wait to see everyone. We spend months planning ways to make the day fun, and spend weeks wondering what fun moments will happen all on their own. 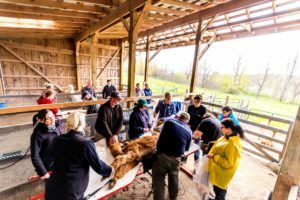 It’s impossible to put over 20 volunteers together with over 20 alpacas, in a barn filled with music and characters, and not have some memorable, laughable moments you will never forget. We lay awake wondering how the alpacas will look by the end of the day. Though we have seen hundreds of alpacas with those crazy haircuts, you never get tired of seeing what your own herd look like when they come off the shearing table. We anticipate what we will learn as that fleece comes off revealing the true look of some of our alpacas for the first time. 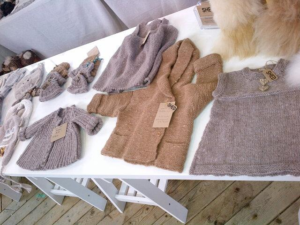 And we imagine what type of fleece will each produce – it’s quality and characteristics. A kaleidoscope of colours is created with fibre as it’s turned into yarn. with the volumes of fibre our farm produces. When we were processing and retailing our own fibre, I would lay awake at night thinking about the grades and colours of fibre we had in the herd and how I would blend those to create some beautiful yarns and other products. 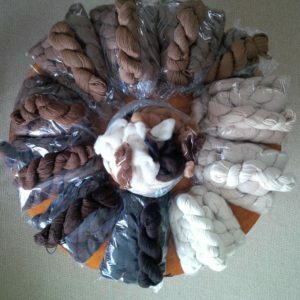 I couldn’t wait to get my hands in that fibre after shearing day to start dreaming about what we would create for fibre artists. Our daughter, who enjoys training and showing our alpacas, admits she lays awake at night in anticipation of the shows. She wonders how many ribbons we may bring home with us. She can’t wait to get there and see the wide variety of alpacas and everyone’s breeding and acquisition results over the past year And she looks forward to seeing our alpaca friends and family, some of whom we only get to see each year at the show. It’s something we all look forward to. Any serious alpaca breeder that won’t admit they lay awake at night in anticipation of the arrival of their cria is being less than truthful. Meticulously planning those breedings, and almost a year’s gestation period, leave even the most hardened, experienced breeder filled with excitement to meet that baby for the first time. 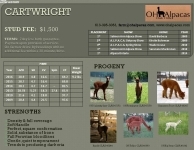 Cria are the culmination of many years of careful breeding and animal care. And let’s be honest – they are just so darn cute! 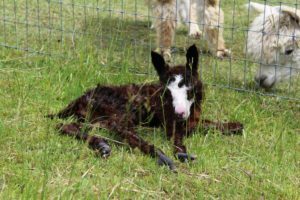 With 22 natural shades of colour in their fibre, you spend many nights imagining the colour combinations that might arrive as each cria hits the ground. Add to that what characteristics that breeding match might produce and your excitement builds. 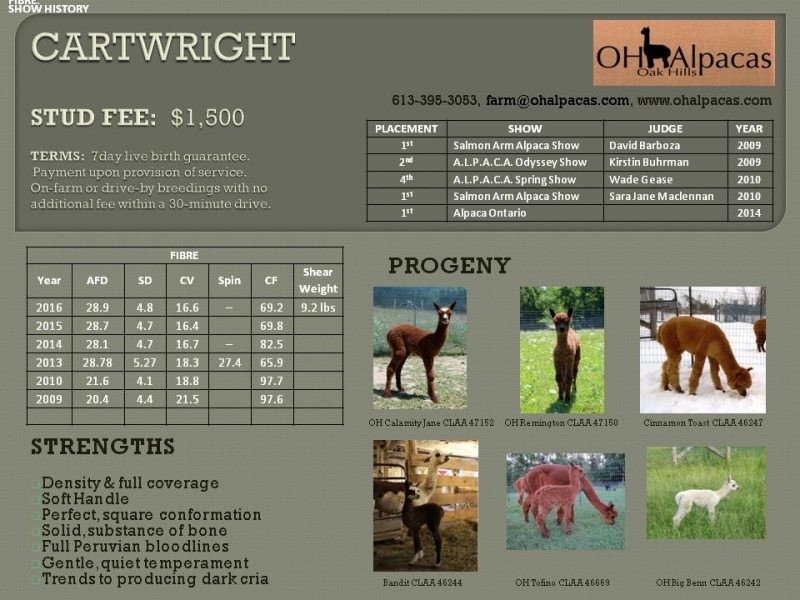 And our family has a lot of fun with naming our cria, so we do spend many nights thinking about fun combinations of names to give each of our cria a distinct identity. Watching cria play together in the pasture plays back like a film reel in your head as you slip off to sleep. Put two little ones together and let the show begin! As we drift off to sleep we recount how pleased we are with the fibre they begin to produce. The true joy and amazement of someone who has never met alpacas before; holding them and feeling the softness of that first fleece, never ceases to bring us joy too. We never get tired of seeing that amazement in the eyes of others which reminds us how lucky we are to do this every day. 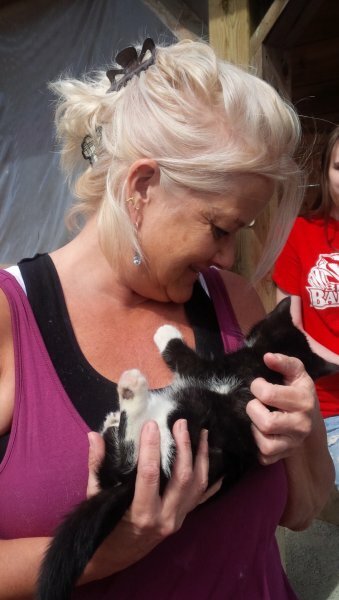 It’s hard not to fall asleep with a smile on your face after a farm visit like that. 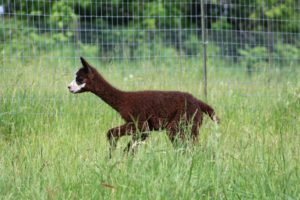 As our alpaca farm herd grew and each new breeding season approached, we could lie awake for hours dreaming of all the breeding combinations that we could apply within the herd and the beautiful cria that could result from each pairing. Similarly, herd planning fills our thoughts as we lay down to rest, anticipating who we will keep, who we might sell, and all that goes with watching our farm and herd grow. We are a breeding farm and we specialize in new farm start ups – helping others find their ideal herd. This is what we love, and we do get swept up in the excitement of others who are discovering alpacas and the potential of their own properties to support a profitable fibre farm. 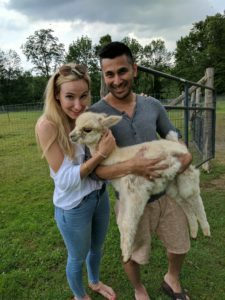 So we often lay awake at night in anticipation of making a sale to a family who is finding their first herd and falling in love with alpacas themselves. It’s exciting. We love watch a new farm begin and grow. Sometimes we are the customers, buying new alpacas to join our own herd. And we get no less excited about that. Recently, for our daughter’s birthday, we bought her first alpacas to start her own herd: a male, and pregnant female. 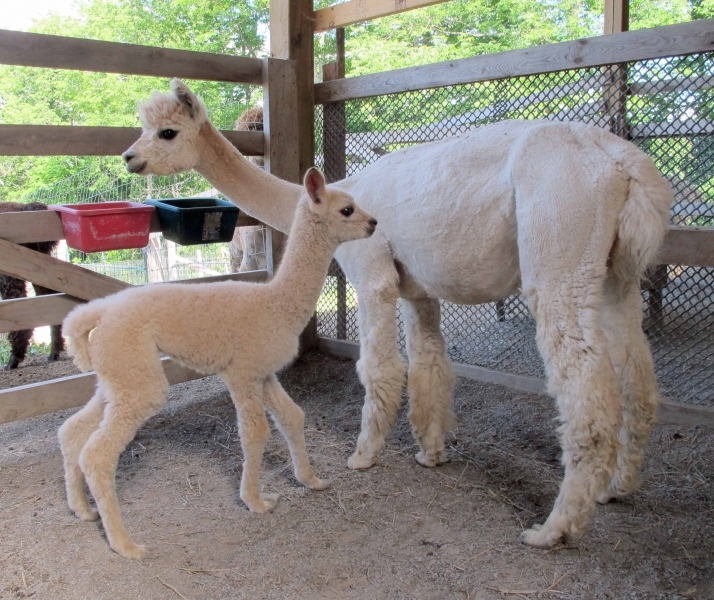 We live in Ontario and worked with an incredible farm in Alberta, Sunny Hill Alpacas, to get the alpacas to Ontario, get them registered in her name, and keep it all a surprise for the big day. I’m not ashamed to admit that I laid awake many evenings imagining her surprise. And I don’t think she slept for days afterwards, imagining what her first cria will look like next season, and what she will do with the genetics both alpaca offer in the years ahead. And I’m sure she drifted off to sleep several nights thinking about what her own farm name would be. And that is how Red Oak Alpacas came to be. The farm sees us outside working with our hands, breathing in the country air, soaking up the sunshine, and ready for bed after a long day. Above all else, when that smile creeps across our faces as we drift off to sleep, it’s all about the accomplishments we have achieved along the way as we developed our alpaca farm. It’s almost unimaginable what rookies like ourselves have been able to do; designing and building our barn and how well it works, learning to take care of the farm and herd, the herd we have developed by breeding up and making strategic purchases, the sense of community we are a part of, and the amazing clients we have been privileged to work with over the years. If we can do it, you can too. Our life, night and day, at work and at rest, has become very much about the seasons and all that each season brings. For every worry, there are dozens of rewards and gifts that farm life gives. At the end of the day, our alpaca farm has made for some very sweet dreams. Originally published in the September 2017 issue of Camelid Quarterly. A special thanks to the editors for their permission to reprint.